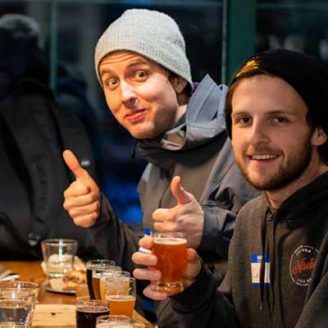 Whistler Craft Crawl is a tour of some of Whistler’s best bars, while sampling some of Canada’s best beers. It’s an amazing, Social Tasting Experience. It’s an easy and fast way to see and sample what Whistler has to offer. You’ll meet our host at a local venue in Whistler. There you will be introduced to everyone else on the tour and be given a warm welcome. Your host will walk you through everything we will be covering in the tour. After visiting several places, sampling various beers, hearing the history, learning the village, meeting new people, sampling some great food and having a great time, you’ll be asking when you can do it again. Included is a full flight at each of our carefully selected venues. That's 4 unique beers at each bar, a variety of 16 of Canada's finest. We even have a notecard for you to keep track! And along the way 2 of our venues will show off thier tastiest bites. Enjoy samples like polenta bites, sliders, etc. 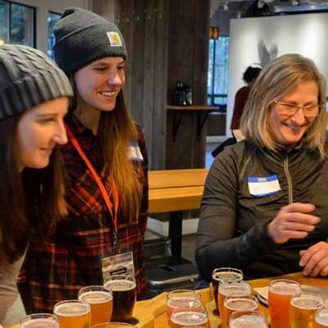 You start your Crawl off meeting our knowledgeable friendly beer pro, who will be your host, and guide, for the entire event. 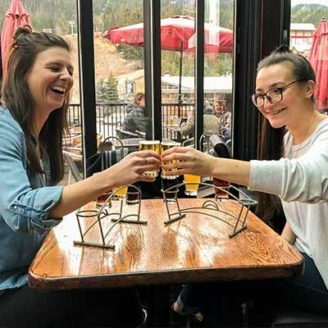 Your host is both a beer enthusiast, trained with detailed craft knowledge, and a local, with all the insider insights into one of the world's most prestigious resorts. Whether you show up on your own, or you're part of a larger group, we've designed the Crawl to be a social experience that will leave you wanting to do it again. Be sure to check out the photos from the Crawl. We'll be sure to snap a couple of them by the picturesque Olympic Rings. This process is fast, easy! Once you purchase your ticket, you meet us at the starting time and location displayed on this site. Grab your tickets, meet us first venue with your I.D., and don’t be late!